Episode 85 of the podcast features a discussion about the astrological outlook for August of 2016, with astrologers Kelly Surtees and Austin Coppock. During the course of the discussion we talk about Mars finishing up its post-retrograde shadow period, whether or not the Full Moon on August 18th really counts as a lunar eclipse, and the relationship between the current Saturn-Neptune square and the craze surrounding the augmented reality game called Pokémon Go. I also highlighted some auspicious dates for beginning different types of ventures and undertakings, using the principles of electional astrology. As always, the cover art for this episode is from the 2016 PlanetWatcher Astrology Calendar. Below you will find the show notes, followed by links to download or stream the recording of our discussion. The podcast is sponsored this month by two astrology software companies, and we will be giving away free copies of their programs to two lucky patrons of the show on the next episode. The giveaway prizes include a free one year subscription to the new online astrology program for archetypal astrology called Archetypal Explorer, as well as a copy of another popular astrology software program called Solar Fire. For more details about these programs or information about how to enter the drawing please see the giveaway description page for July. 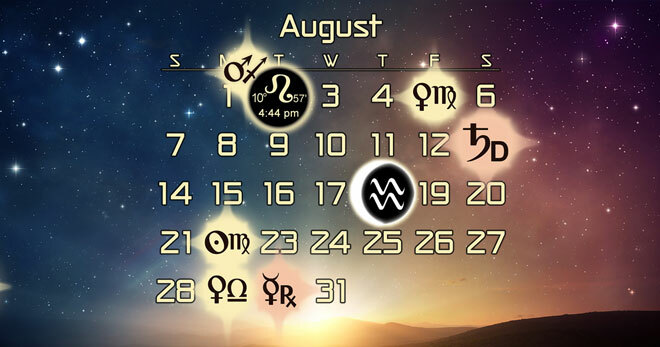 Mars ingresses into Sagittarius August 2nd. New Moon in Leo on the 2nd. Full Moon (eclipse?) on the 18th. Sun ingresses into Virgo August 22. Venus into Libra on the 29th. Mercury stations retrograde on the 30th. This month’s dates were selected by Leisa Schaim, who offers electional astrology consultations through her website at LeisaSchaim.com. Be sure and look at Zet- http://www.zaytsev.com/ -The free works great for quite a lot. How come you didn’t include aspect lines this month in the election charts? I know some astrologers don’t feel they’re necessary. I find them hugely helpful. TMA usually has us remove them for publication, and I guess we just forgot to make new PDF files with them turned back on. Chris really looking forward to your book! Thanks for the great Astro conversation! I have Virgo North Node/Pisces South Node, l am riddled with Arthritic pain in my joints for weeks, and dealing with releasing the pain of a toxic relationship, l knew l was feeling my Nodes being affected but that was scary! Can you do a show on the Nodes please. It’s always great to hear you three flesh out the monthly breakdown and any stream-of-conciuosness debate issues that come up. We’re definitely listening and you’re efforts are appreciated. I really liked the insights shared by Kelly and Austin on the South Node (Pisces) and North Node (Virgo) and different perspectives. August will be a “hot” month indeed! Great podcast Chris, Kelly and Austin. Thanks! So at the risk of sounding like a total geek, I am using boomerang to time the e-mails I sent to several allies tonight to take advantage of the most auspicious elections dates and times. After listening to the podcast, I decided to set aside the evening for a night a home to plan ahead and thinking about the alliances I want to initiate in the coming months. I have the most incredible new roommate after planning my search around the best date in early July. So Leisa Schaim dates are becoming something I plan around seriously. The 11:04pm chart has several planets, the sun and the north node and lot of fortune in the 5th house. Does that mean it’s a good time for money and 5th house affairs? I will let you know I programmed all the money e-mails for that time. The 2:21am chart has several planets, the sun and the north node in the 3rd house. Does that mean it’s a good time for 3rd house affairs? I will let you know. I programmed some spiritual community volunteer working e-mails for that time. Does the rising sign affect things at all? I was making some judgement calls about whether to schedule boomerang to deliver messages at 11:04pm or 2:21am. I’m not clear whether I should look at houses with planets, the rising sign, or other criteria to make the judgement call. It would be great if future podcasts could share more details. The responses to all the e-mails i timed have been pouring it and its been exceedingly favorable. Leisa Schaim IS A GENIUS!